The mechanical actions you take in your pre-pitch motion will determine the momentum you build for your pitch. In today’s video blog post, we break down the the elements you want to pay attention to in your pre-pitch motion. Because the purpose of your pre-pitch motion is to build up momentum and speed for your pitch, ensuring the following mechanics are implemented properly will ensure your pitching success. 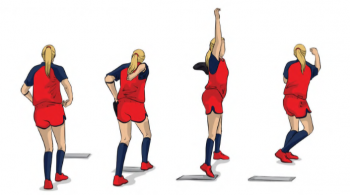 Make sure the pitcher is balanced on the mound, with the feet a little more than shoulders-width distance apart. The pitcher’s back toe should be up, and the front leg bent. Bending at the waist, the upper body should begin to drive forward. The weight should shift from the back side to the front side, and you should have a little bit of a drag through with the foot. This is going to get the pitcher up on the front toe, so that as they go to push out, they’re driving on that toe. Looking for more awesome drills and tips? Then be sure to check out Championship Coach Sue Enquist’s other Softball Coaching Videos! Sue will share some great tips and softball pitching mechanics, hitting and much more! And don’t forget to Like Us on Facebook, where we share more great ideas and suggestions for your practice plan!